And no, not a human baby. After our elderly oven tried to sabotage my choux puffs (and not the first time it has shorted out), we started shopping around for a new oven. We looked at several options, including trying to plug in the old guy again after having lain dormant for over 24 hours unplugged (that was a no-go; it started heating spontaneously again), and ended up purchasing the lovely specimen above. 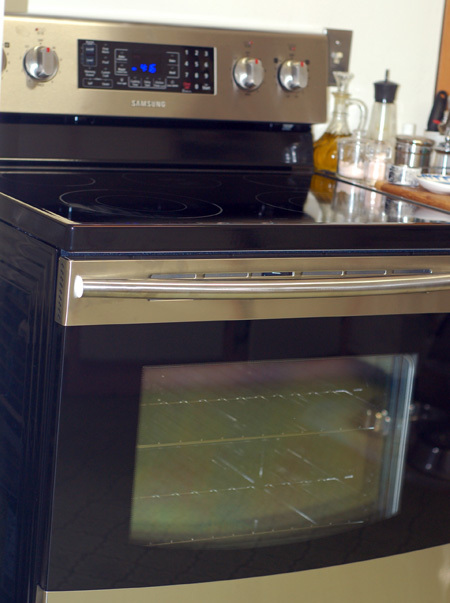 It has a ceramic range with dual-sized burners and a warming zone, a full convection oven with a greater temperature range than my old one had, a hidden bottom element and steam clean function, a warming drawer, and even a proof setting for helping yeasted bread doughs rise (the latter is so much more appropriate for us than the “chicken nugget” and “pizza” settings we saw on some models, I can’t even begin to tell you). Plus, it’s all pretty and stainless steel. This oven is so shiny and new that I’m almost afraid to use it for fear of messing it up. Plus, I now need to read up on the ins and outs of convection baking. But nonetheless, I’ll be breaking it in very soon, because it’s dinnertime! Whee!